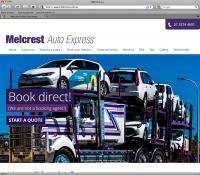 Melcrest Auto Express transports vehicles all over Australia, specialising in car carrying from state to state and town to town. Melcrest needed a system that allowed users to lodge a quote online, and then pay for this quote (i.e book their car in) if they decided to go ahead with their job. The original specification was pretty basic, develop two forms that allow users to firstly "lodge a quote" and then "pay for the quote". However we took this a bit further. Specifically we recommended to Melcrest that we develop a "workflow" that tracks the quote from initial lodgement, all the way through to when the car gets on the truck. Develop a quote request form, that allows users to enter their details, the makes ,models and any special attributes (i.e. has a bulbar) of the cars (note multiple cars can be included in one quote). Upon quote request, a confirmation email is sent to the user confirming their quote has been received. Melcrest logs in, reviews the quote and adds a price to the quote. At this stage, a fully formatted "quote" is automatically emailed back to the customer. 7 days later a reminder is sent to the customer if they have not booked in. User clicks on a unique link in the quote email, to take them to a booking form. At this stage the system automatically "looks up" their details (so they don't have to re-enter). User then provides the final details for their booking and makes payment (which is processed in real time). The quote is now flagged in the system as a "confirmed" booking, which then prompts Melcrest to add this car to particular manifest. Note cars can be transported on multiple manifests (i.e Brisbane to Mackay, Mackay to Cairns). Melcrest then can print out a manifest containing all cars that have been booked and hand this to the driver.